Ingrate ‘Migrant’ Savages Amok In Madrid! Riot police and firefighters were deployed to Lavapies, a district in the centre of the Spanish capital with a large immigrant population, as angry protesters set fire to dustbins and a motorbike, and threw stones at security forces. About time the Spanish cops got stuck into these arrogant scumbags, whom I’ve just seen on tv news, hollering ‘No human being is illegal.’ But since they are illegal – they were also roaring ‘Police, get out of Madrid!“ – are they thus telling us they are NOT human beings. Their amok-run tends to suggest just that. If Spanish citizens were involved, their violence should be repaid ten-fold. But it seems any Spanish hoodlums in the mob were outnumbered by aliens. 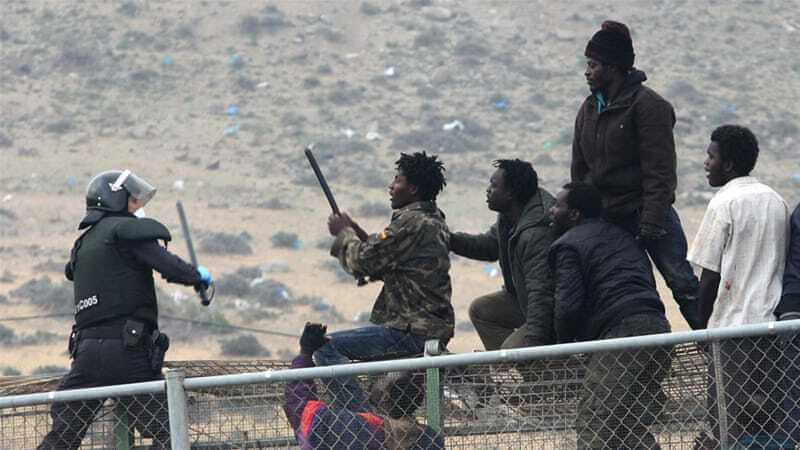 If the rioters were not Spaniards, they are uninvited, uncivilised guests – trespassers – and should show proper humility. In a more civilised world, they’d be required to doff their caps whenever honest Spanish citizens pass by, to show due respect. But what’s all the fuss about, to turn the Spanish capital’s streets into scenes of mayhem? Violent protest in Madrid over migrant death! …and one might imagine there’d been a drive-by, the said ‘migrant’ sitting on a park bench minding his own (legitimate?) business, or that he had suddenly been dragged into bushes for no reason, and chopped up. The riotous rabble were doing their mayhem thing because ‘an illegal vendor‘ had been caught in his criminal activities, took flight and was quite properly pursued by police. He is now dead – a heart attack, no doubt due to unaccustomed physical exercise aka doing a runner from law enforcement – no great loss. Same as that other crimmigrant we covered recently. Wow! The Leftal Gets It Right On Illegals, Briefly! It’s not clear from the report whether the Senegalese was not just an illegal vendor but an illegal immigrant. Whatever, he had NO right to be where he was that day, doing what he was doing. Time Spain cleansed its capital, and all its territory, of undesirable aliens. Oh, and STOPPED any more violating its frontiers! At last a bit of honesty in telling us what it’s all about. The big media have bits of the truth hidden away but you need a gold-miner to dig them out. So the illegal was running away, not because he was just being chased by police (for fun, the way some media are reporting it!) but because he was operating an illegal business. Not only that, but he had been illegally in Spain for nearly 15 years. The true scandal here is that the police or their government bosses have tolerated this crimmigrant all that time and not kicked him out? We have the same kind of problem here in Australia, those Sudanese animals in Melbourne. Nobody in our government has ordered any of them out of our country. First class coverage when so much of the media are sniping away at the police and playing down the way this criminal died. You are quite right to say these ilegal alien will not be missed and I add to that, none of the crimmigrants would be missed if they all dropped dead right now. The sooner Spain locks them away till there is a plane to put them om, the less trouble they can cause, the less burning, looting and rioting Madrid has to suffer. Not only Spain, but all the other European countries that have let them in too. I have read much today about this trouble in Spain and only after reading this from you do I see the larger picture. It’s difficult to believe that top photo was taken in one of Europe’s historic cities. Who allowed all those aggressive savages to settle there? Spain, yes, so why is Spain one of the few countries without a patriot party making headway? That had better change fast.or no more Spain. ← Selamat Hari Raya Nyepi – No St. Patrick’s Partying In Bali!